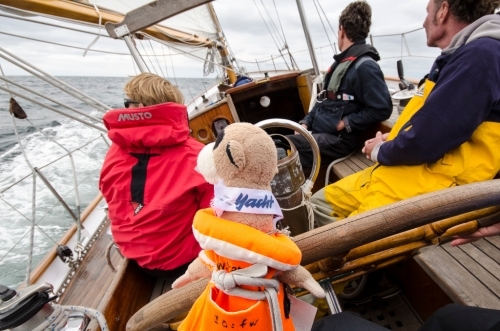 After a couple of weeks hard work as an intern, Fred was invited to join a weekend with one of his collegues from YACHT. Lasse, who is working as an editor, took him to his boat on the Baltic Sea where he first met the children of Lasse and they loved Fred from the first moment. Fred was also happy that he found such nice new friends and he spent the whole weekend with them. Later he kept an eye on the clothes while the others where swimming. With a heavy heart Fred had to say bye bye to his new friends and he was driving back to the office with Lasse. Before that he enjoyed the nice view of the Kiel Fjord. A weekend later Lasse invited Fred again for some days. 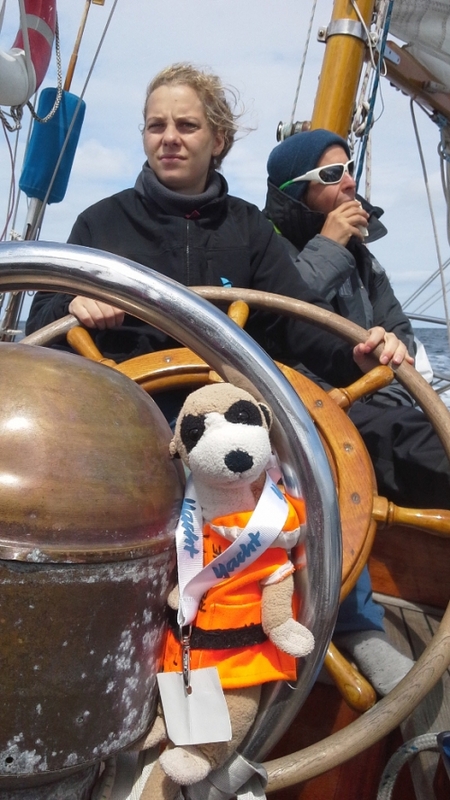 This time not with his family but Fred was joining a regatta on the venerable ship "Peter von Seestermühe“. The ship was built in 1936 in Gdansk and took part in many different races. The most famous one was the first „The Whitbread Round The World Race“. The race Fred was joining was called "The Run“. The course was from Kiel to Svendborg in Denmark. Svendborg is a nice city in the South Funen Archipelago, one of the most beautiful sailing areas in Northern Europe, so Fred was quite excited. He was a little bit afraid that he will be sent to bed but of course he was allowed to stay awake the whole night. And he was a great help. As an experienced sailor Fred took care of the navigation. The "Peter" achieved a good ranking and on it's way back Fred was allowed to steer the whole time.